Along with the Xperia XZ2, Sony is also introducing its little brother, the Xperia XZ2 Compact. The smaller version might again take the place as the best Android smartphone in the compact class, as Sony hasn't cut it down in any way. Our review of the Xperia XZ2 Compact also shows that Sony has finally improved the quality of the camera and caught up to the competition. The Sony Xperia XZ2 Compact has been listed in some online stores since March 2018 at the recommended retail price of $649. It is available in Black, White Silver, Moss Green, and Coral Pink. The device was made available to pre-order in the US starting on April 13th, 2018. Sony has said that the device will be certified for use on Verizon, and it will also work on GSM carriers like AT&T and T-Mobile. The device will be available unlocked on Amazon starting May 20th. In a world of ever-growing smartphones, the Sony Compact series was the quintessential counter-trend: these devices are the only option for Android fans seeking a high-end smartphone with a screen diagonal of less than five inches. When Sony came out with the poorly-performing X Compact, they were criticized for it. They silenced this criticism with the XZ1 Compact. It marked the return of the fast compact device. But it’s the XZ2 Compact that really offers all the high-end features Sony currently has in stock, along with a new design after five years of OmniBalance. When you compare the data, the Xperia XZ2 Compact stands out due to its enlarged internal memory and improved display. The camera is another area of improvement. Sony has reduced the number of megapixels, but made improvements in all the other areas, and in doing so, is offering a competitive solution for the first time in a long time. OmniBalance and Loop Surface are a thing of the past. Sony’s new smartphone design is called Ambient Flow, which features an 18:9 display, a bulbous back and a fingerprint reader on the back. For the first time in a while, Sony has created a successor that’s also an entirely new device. Ambient Flow allows the Xperia XZ2 Compact to remain 65 mm wide even though the display has grown to 5 inches, thanks to its 18:9 format. The XZ2 Compact has become longer and thicker; it’s 135mm long instead of 129mm and 12.1mm thick instead of 9.3mm. The Sony Xperia XZ2 Compact is dustproof to the IP6X standard, and protected against water and pressure to IPX5. It’s also protected against permanent immersion at a depth of over 1 meter for 30 minutes, up to an IPX8 standard. The display has been improved — finally! The resolution of the display has finally been adapted to modern times. With 2,160 x 1,080 pixels, the Sony Xperia XZ2 Compact’s 18:9 display offers exactly the same screen resolution as the 5.7-inch non-compact version. The compact display also offers HDR optimizations. We’ll have a detailed test of the display on the site for you shortly. We’ll measure the brightness and color representation and compare the values with the competition. As per usual, Sony offers extensive options for customizing the display. The HDR display finally comes with Full-HD+ and converts low-resolution content with X-Reality. And thanks to Triluminos, the color accuracy has also increased. As mentioned earlier, Sony has almost always equipped the latest Compact with the best hardware available on the market. With the new Xperia XZ2 Compact, Sony has gone ahead and kept this trend going. The cameras and the device’s set of features correspond with the Xperia XZ2. The CPU, RAM and internal memory do as well. The only differences are that the larger XZ2 comes with wireless Qi-charging, bass replacement through a vibration motor (a.k.a. Dynamic vibration) and it comes with a Quick Charge 3.0 power supply. This raises the question as to why anyone would spend an extra $150 on the larger model. Whatever you do with the Xperia XZ2 Compact, it won't take long. With UFS 2.1 memory, the latest Qualcomm chipset and enough RAM, it's virtually impossible to build a faster smartphone. On average, it ranks between the OnePlus 5T (the fastest smartphone of 2017) and the Samsung Galaxy S9+. It’s almost on par with the Galaxy S9. These benchmarks were based on the GPU and CPU, which strongly depend on temperature, so they’re subject to fluctuations. The Sling Shot benchmark with OpenGL ES 3.0 was between 3560 and 6359 points; Geekbench’s were between 6940 and 8470. When the device is connected to a power supply, the chips throttle. The Sony software isn’t as overloaded as it used to be, although uninstallable apps like Facebook, Xperia Lounge or AVG Protection are rather annoying. Unfortunately, Sony has only installed Android 8.0 and not 8.1. There are some other innovations lacking like the charge indicator for devices connected via Bluetooth. On the other hand, the Xperia XZ2 Compact supports A/B updates, i.e. update installations in the background and without a long restart as well as Project Treble. Treble should make it easier to reuse the device is Sony discontinues support with monthly security updates in a few years. Although the detailed battery test and direct comparison with new competitors is still pending, the battery life seems to be pretty good to me. Together with time-controlled energy-saving modes, the ‘Xperia actions’, the device can run for almost two days. However, the energy-saving mode results in massive losses in performance, leading almost every app to jerk. Since everything then takes longer and the display stays on corresponding longer, this probably doesn’t help you save any battery power in the end. I avoided the Stamina mode in my tests and got by just fine. The screen can stay on for almost five hours. If you take a lot of photos, play a lot of games, use the AR effect or need high display brightness, the running time will also be reduced. Sony has finally improved the camera. While several predecessors were still quite inexperienced when it came to image processing, delivering low-detail, noisy or bluish images, Sony seems to have really improved a lot this time. That’s a good thing, because as one of the largest image sensor suppliers in the world, every Sony camera should be a showpiece, even if it’s just a mobile phone. The Motion Eye camera not only takes good pictures, it also does a good job with videos. The HDR videos make for an especially exciting feature, because their dynamic contrast makes every video look more professional, since burnt-out bright areas or darkened interiors are adjusted by the system. This even works in 4K resolution, even if the camera app immediately warns of possible overheating. Of course, Sony also offers the Super Slow Motion feature introduced on the XZ Premium. This takes up a fraction of a second at 960 fps. You can either use this feature immediately for spontaneous recordings, or insert it into a normal video recording. In both cases, however, the triggering is manual and doesn’t have automatic scene detection like in the Galaxy S9. It is recommended to use the feature in brightly lit environments. Especially indoors, the short exposure time quickly turns into strong image noise, which makes the videos somewhat unaesthetic. The resolution on the selfie camera has been slightly reduced. For this purpose, it now also offers the 3D scan. It’s quite wobbly and delivers a decent result after a few minutes. Perhaps after some practice, you’ll have an easier time than I did. The models are saved in the Sketchfab and can be ordered or exported for 3D printing. Sony uses forward-facing stereo speakers in both XZ2 versions. The lower one is the right channel, and the upper one is the left. If you use the smartphone in the wrong orientation, the stereo sound will be upside down. The sound is powerful, but naturally free of any real bass. The XZ2 Compact doesn’t come with the vibration motor that’s on the larger model. My colleague Luca, who tested the bigger XZ2, switched off the Dynamic Vibration after two days, so you probably won’t be missing it on the XZ2 Compact. Sony has gotten rid of the headphone jack. Their website advertises an adapter that lets you use a Type-C charger and simultaneously listen to music. The supplied adapter, on the other hand, merely converts the Type-C connector into a jack connector and then blocks access to the single charging port. Sony equips the Xperia XZ2 Compact with the high-resolution Audio1 and LDAC audio optimizations. DSEE HX should get more details out of compressed sources. Other technologies such as ClearAudio+, Clear Bass and a five-band equalizer allow fine sound adjustments. Not all manufacturers can offer all these options. With no other manufacturer currently offering a top compact smartphone, the Xperia XZ2 Compact is the best smartphone in the compact class. It stands out in various categories to much larger and more expensive competitors and doesn't perform poorly in any respect. Another highlight is that Sony offers the Xperia XZ2 Compact for around $150 cheaper than the XZ2, although it's practically the same model in a small size. With the more compact versions of smartphones from other manufacturers, they usually require making major cuts to the memory or camera's performance. 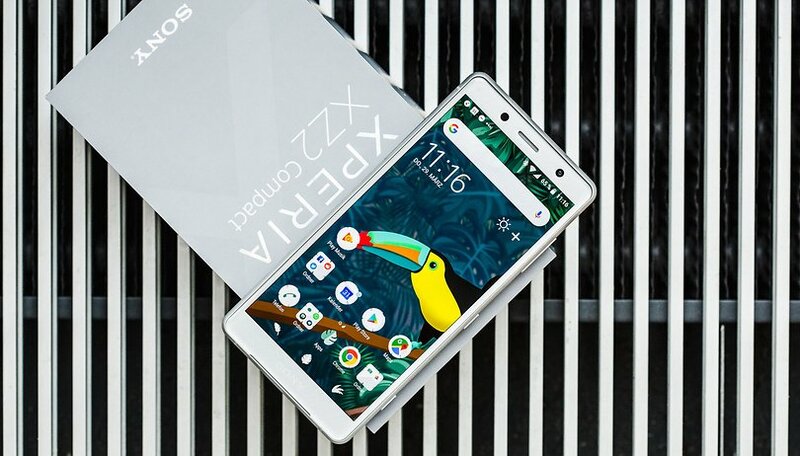 That's not the case with Sony; the XZ2 Compact is a first-class device in the smallest frame. What do you think of the Xperia XZ2 Compact? Are you going to head out and purchase one any time soon? Let us know in the comments! Sony warranty service is terrible. I had a Sony Xperia Compact phone that had a defective microphone. The sound was quiet and muffled to anyone listening on the other end. By the time I realized how serious this problem was, it was too late to return the phone, but I expected I would be covered under Sony’s warranty. I was WRONG. Sony does not stand behind any product sold on the Internet. They will tell you the device was not sold by an authorized seller, so they will not honor the warranty. Why should it matter where you buy the phone? If you buy it brand new, and it has Sony’s name on it, Sony should stand by their warranty. What is worse is that Sony gave me a return authorization number, so I actually did send the phone in before they notified me that it would be returned without being repaired. It took ONE FULL MONTH just for them to return it. I doubt they could have fixed the problem anyway. In summary, my experience is that Sony makes low quality junk, and they do not stand behind it. Generally like the idea of a 5" phone that feels like a 4.5" phone in hand, question of whether apps display right. Have to say - "Sony Xperia XZ2 Compact" - eleven syllables to get the name of the phone right is ridiculous - OEMs should give users a break. i think the new model is as ugly as sin. looks like an obese person squeezing into one of those body scanners at the airport. i have to agree. i needed dual sim phone and was looking for s9 or lg v30. i had no intention of buying xz2c but I absolutely LOVED the way it feels in the hand. The obesity has smth to do with it. All about ergonomics and tactile magic. Bought it yesterday. So far so good. Design and latest model Sony Xperia XZ2, really amazing. How much is the price of Sony Xperia XZ2 mobile phone?